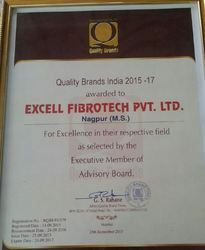 Established in the year 2005, at Nagpur (Maharashtra, India), we, “Excell Fibrotech (P) Ltd.”, an ISO 9001:2008 certified company are the leading name engaged in manufacturing, wholesaling, supplying, trading, distributing, importing & exporting a qualitative assortment of Fibreglass Reinforced Plastic Products. Our products include Playground Slider, FRP Portable Cabin and Portable Toilet. These products are precisely manufactured using optimum quality raw material and are designed with high precision. Our primary objective is provide appropriately developed and safe playground equipment, which offer children a good positive experience in the environment. As per the varied requirements of clients, these can also be availed in both standards as well as in customized options. We hold the privilege of catering our clients with high quality products and playing equipment with fine finishing, complementing color and durability. These products are fabricated under the supervision of our skilled professionals, who are familiar and proficient with all the installed machines and latest technology at our infrastructural unit.Our team members keep upgrading our product line as per the changing market demands and customer feedbacks. These superior quality of equipment are designed using modern techniques and knowledge with utmost dedication of our eminent professionals. 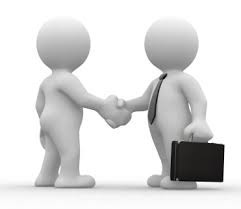 Offered products are capable to fulfill our clients’ varied needs in an efficient manner. Apart from this, we conduct various training sessions and seminars in order to keep them abreast from the current market developments. With a workforce comprising qualified engineers and process specialists from the industry, we have been able to manufacture and supply Playground Equipment of the highest quality. We understand the value of time; hence we are committed to deliver the urgent orders of our customers within the stipulated time frame. We have reached a distinct position in the market by offering the superior quality products in order to gain their maximum client satisfaction. Our CEO, “Mr. Srrinivas Warambhey”, has guided the team to work with efficiency and has motivated them at every step to work for client satisfaction. We export our products all over Asia. 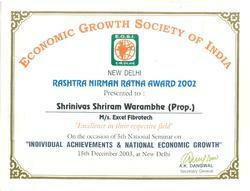 We received the Rashtriys Nirman Ratna Award 2002, by the hands of Hon. Minister of Science & Technology, Shri. 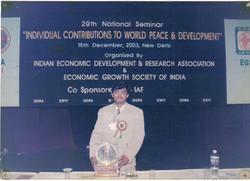 Bachusingh Rawat. 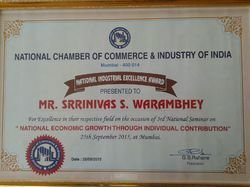 This award is given by economic growth society of India at Habitat centre New Delhi; for an excellent performance in Fibre Industry. 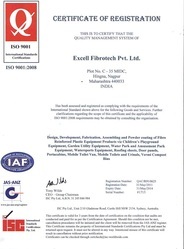 Being An ISO 9001:2008 Certified Company. We maintain high quality throughout our fabrication process. We source only quality tested raw material from the trusted vendors of the industry. Following quality control procedures, we carry out stringent checks at every stage starting from procurement of raw material to production, packaging and delivery of finished products. We test the offered products on well-defined parameters in order to deliver only flawless products at clients’ end within the specified time frame. The Company employs most modern techniques and automation systems to handle its more than 3000 Customers and clients with great ease. 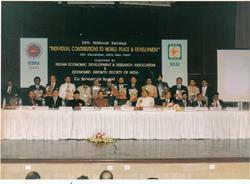 Presently the Company employs more than 50 peoples at its Head Office and its various branches. Our infrastructure is spreads over a large area of land is installed with hi-end machines that allow us in fabricating products in bulk quantity. 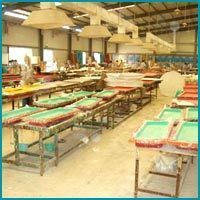 In order to carry out smooth production process, we have segregated our infrastructure into various divisions like manufacturing, quality, sales and marketing, etc. These units are meticulously managed by our expert professionals in order to offer the best quality products. 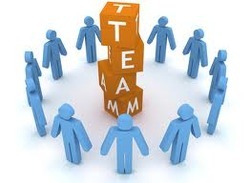 In order to move with the fast pace of this occupation, we offer crucial training sessions to our team. Divisional Forest Officer - Marwahi Div. Sunflug Iron & Steel Co Ltd.
Aurangbad Sahyader Cons Pvt. Ltd.
Penguin Pools & Construction Pvt. Ltd. In order to survive the stiff market competition, it is important for us to be able to cater to the specific requirements of our individual clients. This helps us in garnering their appreciation and loyalty. Keeping this in mind, we offer our clients with customization of our Garden Playground Equipment, All Types of FRP Products and Fountains, as per the specifications provided by them. We have appointed a highly creative and experienced team of designers, who work in close coordination with the customers, in order to understand their needs in an appropriate manner. Moreover, we also offer our clients with the option of getting their consignments, as per their specific needs. We are instrumental in providing our customers outstanding range of Multi Play System, Outdoor Multi Play Station, Garden Bench, Playground Slide, Playground Climber, Merry Go Round, Kids See Saw, Playground Equipment, Water Park Equipment, Motor Boat, Playing Swing, FRP Porta Cabin, etc. These are manufactured keeping in mind the requirements of our clients and we also make sure that these products are delivered within the given frame of time.